Clayton began his woodchopping career prior to 1950 and continued to the year 2000. He competed in Australia wide winning many Handicap and Championship events. Although Clayton was more noted for his precision cutting in Standing Blocks he also competed in Underhands, Treefelling and Sawing, both Single and Double. He travelled overseas to USA and Canada where he won 17 World Titles in about 13 years from 1963-1976. Clayton represented Tasmania and Australia in Teams events, he also represented Australia with Doug Youd at the World Sports Expo in Montreal, Canada in May 1967. To our knowledge he still holds World Records in 12 inch Standing Block in 13.7 seconds at Latrobe Tasmania in 1965, also in the 30 inch Butchers Block with Ron Sherriff in Brisabane in 1965 in a time of 3 minutes and 26.7 seconds. One of his pride of joy wins was the Sir Henry Bolte Cup 14 inch Standing Block Championship at Cann River Victoria on 20th April just after the Sydney Show, actually Tasmanian axemen were placed 1st, 2nd and 3rd in this event which supposedly got up the nose of the Victorians. Clayton has a room in his home where his trophies are all on display, that is how many over the years he had won. His last win at Royal Shows was Adelaide 1995. A 10 inch Standing Block Handicap where he defeated his son Garry. He was very proud to be a part of a minority of families where the three generations all competed together at a Royal Show in a 3 man Team Relay with his son Garry and grandson Robbie in 1991 in Adelaide. To our knowledge this was a first. 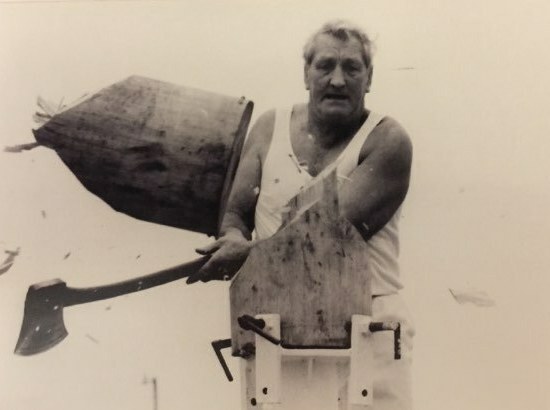 Not only was Clayton a competitor, he also supplied logs many times for the North West Tasmanian Axemen’s Association, especially the Devonport Regatta, and supplied the standing block clamps for the NWTAA. He was willing to teach and show other axemen his knowledge in woodchopping, and many a time a young American would show up on his doorstep to learn the Clayton Stewart way. 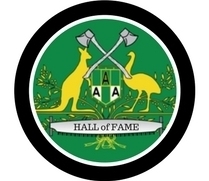 In recent times he also supplied a lot of timber for the Australian Axemen’s Hall of Fame in Latrobe, Tasmania.